A panel of speakers at the National Convention Against Assault on Journalists held in New Delhi on September 22, 2018. Screenshot from YouTube by user Media Vigil. Abuse, intimidation, and attacks on journalists and media organizations are nothing new in India. In June 2018, veteran journalist and editor-in-chief of Rising Kashmir Shujaat Bukhari was shot dead (along with two police officials assigned for his protection) by gunmen in Srinagar, the north Indian state of Jammu and Kashmir in India. While the killing evoked public outrage, it failed to change the ground reality for journalists. Bukhari became the fourth Indian journalist killed this year in connection with his journalistic work, and many more continue to face threats from both state and non-state actors. 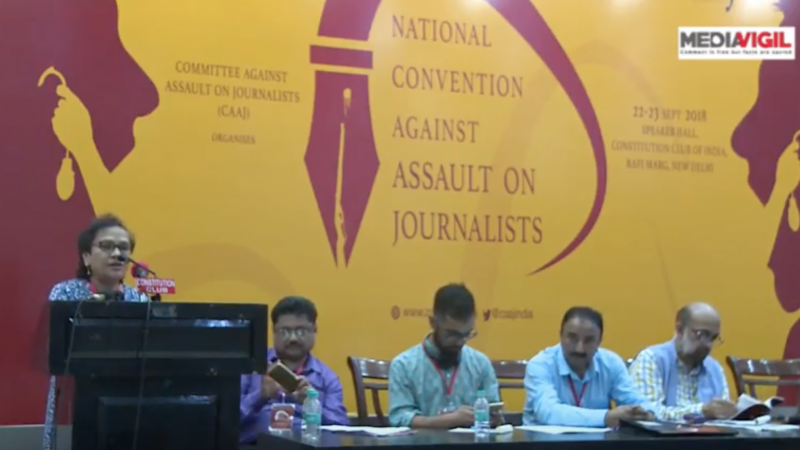 The National Convention Against Assault on Journalists was organized by the Committee Against Assault on Journalists (CAAJ) in New Delhi last month and a number of notable Indian journalists were present. After Modi's election in 2014, critics of the government were labeled as “Anti-Modi,” later as “Anti-India,” and then as “Anti-National,” Kumar observed. This type of rhetoric appears to have turned a significant sector of society against a few journalists, in turn, isolating them and silencing them into self-censorship. In May this year, Kumar reported an increase in abusive calls and death threats from fanatic right-wing nationalists. “It is well-organized and has a political sanction,” Kumar said in an interview with The Hindu. Making his experience a case in point, Kumar emphasized that freelance journalists, women, and those working in rural areas were far more vulnerable to intimidation and obstruction of work, and lacked the support system that journalists in the capital and large cities enjoyed. First convention of @caajindia threw light on horrible plight of journalists working in remote areas. From Bastar to Kashmir to North east media persons face harassment by criminals and police in connivance with politicians.Let us unite and support our colleagues. #PressFreedom. “The onus does not lie on us, it lies on the state to provide a constitutional mechanism to address these kinds of trolling and threats everybody is facing,” said Neha Dixit, an independent investigative journalist, in her remarks at the convention. Dixit described a political atmosphere that discourages journalists from talking about the rights of the marginalized. 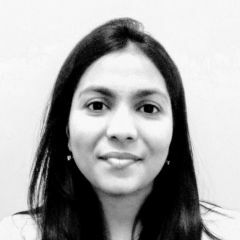 The trafficking and indoctrination of the tribal girls of Assam by right-wing Hindu outfit affiliated with Rashtriya Swayamsevak Sangh (RSS) and the phenomenon of working-class Muslims being killed in fake encounters on flimsy charges or the misuse of the National Security Act (NSA), are two examples of issues that larger media houses appear unwilling to cover. Delving further into the broader problems within the press in India, Dixit lamented that there was no single press body in the country dedicated to addressing the challenges faced by journalists – be it intimidation, false court cases, workplace sexual harassment, or matters pertaining to pay and benefits. Rathor stressed that curtailment of government advertisements [the main source of revenues for newspapers in Jammu and Kashmir], banning internet services, and summoning journalists for questioning by state police or at the National Investigating Agency (NAI) in New Delhi, were some of the common ways the government and its agencies continued to intimidate local journalists. “There is also an attempt to control the narrative [about Kashmir in news] both in traditional media and social media,” Rathor said. 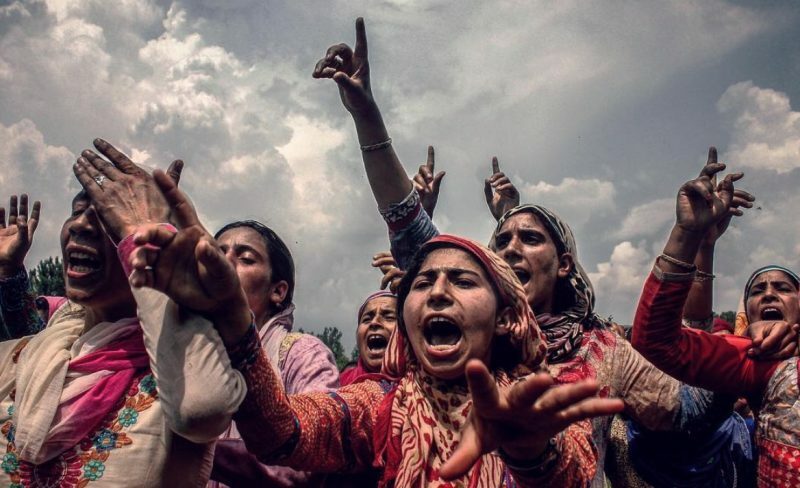 Kashmiri women shout anti-India slogans during a funeral procession of a local militant killed during an encounter with government forces in south Kashmir. Image from Instagram by Ieshan Wani. Patricia Mukhim, the editor of Shillong Times, an English daily in the northeastern state of Meghalaya and a survivor of a petrol bomb attack in April 2018, echoed the same anguish as Rathore, about journalists reporting from conflict zones. Mukhim suggested that for some minority groups, particularly in northeastern India, indigenous identities or sub-identities are stronger than their national identity. She lamented that this kind of ethnic politics, though different from the political culture propagated by the present government in the capital, was equally constricting for freedom of the press. “If you take a stand for or against something, then one or other group will seek your head,” Mukhim expressed. Seema Azad, editor of Dastak Patrika and secretary of People's Union for Civil Liberties (PUCL) Uttar Pradesh, sharply criticized India's Unlawful Activities Prevention Act (UAPA), a law increasingly used to gag journalists along with activists. The 1967 law is intended to combat terrorism and has been made more and more stringent in recent years. Multiple lawyers and activists have argued that it has significant potential for misuse, especially for silencing dissent. Speaking of the impact of crony capitalism, Azad noted, that as the corporate control in India over the years increased — from media houses to natural resources — such attacks have grown.